The CleanFinancial.com guide to trading Twitter shares. Where to Trade Twitter Shares for Free? Where to Practice Trading Twitter Shares? Risk warning - if you are spread betting or trading CFDs on Twitter, please remember that these products carry a high level of risk to your capital and you can lose more than your initial deposit. Spread betting and CFDs may not be suitable for all investors so seek independent advice. The share price is trading higher than the 20DMA of $17.56 and higher than the 50DMA of $16.90. Price data from Google Finance. Also see Live TWTR Share Price & Charts and About Twitter for more information. With the latest set of results, a 21% YTD fall in share price puts the social media firm under pressure to demonstrate progress with monetisation and user growth. In this trading video, IG talk to Stuart Miles from Pocket Lint about what the company needs to do to impress and what avenues need to be considered. Expectation beating results from the social media firm has seen share prices rise, however, IG points out that there are still worries about outgoings and user monetisation. Are Twitter's Q4 User Numbers Reliable? As we have reported before, the firm likes to use non-GAAP accounting principles but that's not my query right now. The firm has just reported some impressive user-based growth figures (see below). However, investors should remember that the firm IPO'd in November with a lot of positive hype and PR. It's not unreasonable to assume that the number of 'new users' and 'active users' jumped during this period of free PR and a lot of column inches. If so, whilst the Twitter user base is no doubt growing, the growth may not be as steep as the latest numbers suggest. Twitter have announced their Q4 adjusted EPS at $0.02 as expected. Q4 revenues were $243m vs $112m in Q4 2012. Is the little birdie tweeting the truth? Caution is needed, Twitter has been known to use non-GAAP accounting principles e.g. see the stories below on 10-Nov-13 and 12-Nov-13. IG have now extended the hours for their Twitter market, investors can now trade the TWTR stock from 9am to 1am (Mon to Thur) and 9am to 10pm (Fri), London time. Cantor Fitzgerald have downgraded the stock to sell from hold. That's the third time in 3 weeks that Twitter has been downgraded. Youssef Squali, the Cantor analyst covering the microblogging site said the "valuation is excessive". According to Thomson Reuters, 20 of the 26 analysts that cover Twitter now have the equivalent of "hold" or "sell" ratings on the stock. For more details see the wsj.com article, Twitter Downgraded Yet Again. Are the Losses at Twitter Being Correctly Reported? Most big firms use GAAP (Generally Accepted Accounting Principles) when they produce their financial reports. However, according to a new report, Twitter used non-GAAP for its pre-IPO filings in order to reduce losses for the first nine months of 2013 from $134m to $44m. Perhaps there was a character limit in its filing. For more see the Forbes.com article 'These 20 Tech Firms Report The Most Fictionalized Earnings'. 12-Nov-13 [11:44am] Twitter had a solid day yesterday climbing from a low of $39.38 to close just off the highs at $42.92. 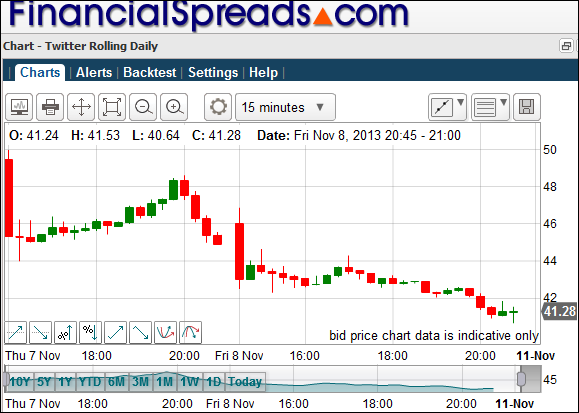 On Friday night, the Twitter spreads market closed at $41.28. That is still well above the IPO offer price of $26.00 but certainly some way off Thursday's high of $49.95. Be careful if you are feeling bullish and want to buy the stock on the spread betting market. Even if you are trading lower stakes like £1/¢ that's a 1,528 point move back to Thursday's open price and therefore a potential £1,528 loss, so make sure you are using a Stop Loss or Guaranteed Stop loss order. And, of course, Facebook showed us that tech stocks with poor fundamentals can fall far below their IPO price. As Matt Basi of CMC said below, "...the trend in recent history is for tech IPOs to be cheaper 12 months down the line than they are on day one". It may be more prudent to sit this one out whilst the stock settles. Or, at the very least, make sure you are on top of your risk management and use Stops/Guaranteed Stops. The FT has highlighted Twitter, Groupon and Facebook in an article on tech firms and dubious accounting. According to the FT, the SEC has "forced Groupon to stop talking about 'CSOI', a measure of profits that, hilariously, excluded marketing costs." The US regulator has also been querying user figures cited social media companies. "Twitter has again brought attention to earnings before interest, taxes, depreciation and amortisation, EBITDA, when it is presented with expenses from stock options granted to employees added back. "For Twitter, adjusted EBITDA, for the first nine months of 2013 was $31m. But the number was positive only because $79m in stock compensation expense was left out. "Whether or not these expenses are ignored in earnings calculations, observers should think hard about share counts. "Equity grants comprise 25% Twitter's 700m total diluted shares. Facebook's reported diluted share count is up a third from June last year. "Company models that use static shares outstanding to calculate share values should reflect the cash expense of buying back shares, or otherwise ensure operating expenses include the full costs of paying employees." This kind of accounting will certainly make life interesting, or perhaps uncomfortable, for long-term investors. So far, in no particular order, Financial Spreads, Capital Spreads, IG, InterTrader, City Index, CMC, Spreadex and ETX Capital are all running Twitter markets. By 4pm the spread betting market on Financial Spreads hit a high of $49.95. It has since dropped off and spent most of the time in the $45-$46 region. Note that because it is difficult for the companies offering the market to currently offload any liabilities on short positions you may not be able to place a 'sell trade' unless you are already long of the market and are closing a position. Be careful if you are trading this market. With most firms you are trading on a £X per 1¢ basis and so it's looking like a volatile market. Looking at the charts, there seems to be support at $45 and resistance at $46 and $50. So with no profits and little historical trading data it looks like the markets are relying on the larger psychological levels. For a look at our coverage of the IPO and how the grey markets predicted a strong start for the micro blogging network, see 'The Story of the Twitter IPO'. Twitter IPO’d on 7 Nov 2013 at $26. Within the first few hours of trading, the spread betting markets hit $49.95. Twitter was founded in 2006 by Jack Dorsey, Biz Stone and Evan Williams. Clean Financial readers should note that you might also be able to take a position on Twitter via other platforms. Where Can I Trade Twitter CFDs? This market may be available with other firms. Note that we also have a live Twitter CFD chart. Where Can I Find Live Prices and Charts for Twitter? 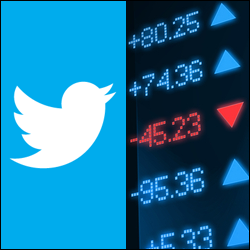 This interactive CFDs chart will offer users a nice look at the Twitter market. The Plus 500 chart above usually shows the Twitter futures contract. If you want live spread betting prices & charts for Twitter, you probably need a spread betting account. A spreads account also lets you trade on shorter-term spot markets. Readers should note that such accounts are normally dependent on credit and status checks. If you were to trade then you should remember that contracts for difference and financial spread trading involve a significant level of risk to your funds and losses could exceed your initial deposit. Advert: Spread Betting and Trading Twitter Shares, sponsored by FinancialSpreads.com. You can spread bet on Twitter with Financial Spreads. Where Can I Spread Bet on Twitter for Free? Speculating does involve risks, but if you would like to try a Demo Account, where you can access professional level charts and trial spread trading, then please see below for more details. When thinking about which investment option is right for you, don't forget that spread betting in the UK is currently tax free*, i.e. it is exempt from income tax, stamp duty and capital gains tax. City Index offer a free Practice Account so you can try spread betting, including markets like Twitter. If an investor is looking to speculate on Twitter then one option is spread betting on the Twitter share price. When financial spread betting on American shares you trade in £x per cent. As a result, if you choose to risk £2 per cent and the Twitter share price moves $0.39 then that would change your profit/loss by £78. £2 per cent x $0.39 = £78. You can also spread bet on this market in Dollars or Euros, e.g. $x per cent. This is a Rolling Daily Market which means that unlike a normal spread betting futures market, there is no settlement date. You do not have to close your trade, should it still be open at the end of the trading day, it just rolls over into the next day. Then you may decide that you want to buy at $47.05 and risk, let’s say, £3 per cent. This means that you win £3 for every cent that the Twitter shares increase and move above $47.05. Nevertheless, you will make a loss of £3 for every cent that the Twitter market decreases below $47.05. Looked at another way, should you buy a spread bet then your P&L is calculated by taking the difference between the closing price of the market and the price you bought the market at. You then multiply that difference in price by your stake. Therefore, if after a few sessions the share price moved higher then you might want to close your position in order to lock in your profit. Spread betting on equities doesn't always work out as you would have liked. In this case, you wanted the share price to rise. Nevertheless, it can also decrease. If the tech firm started to drop then you could close your trade to limit your losses. Note: Twitter Rolling Daily spread quoted as of 07-Nov-13. If you want to follow people who tweet about spread betting/CFDs, we've added a few options below. Here we take a look at the 2 months leading up to Twitter listing on the New York stock exchange. We keep a close eye on the grey markets that a number of firms were running prior to the IPO. I've just been asking around for who else is setting up markets. An unofficial comment from Financial Spreads, "We have got markets set up but need to get the prices through our systems to update spread and margin values". So it looks like the usual suspects will all being running markets by mid-afternoon. When Can I Spread Bet on Twitter Shares? You can currently trade the Twitter IPO grey market with ETX and IG but that market may be a little superfluous given last night's IPO statement from the US firm (see the story below). If you want to spread bet on the Twitter shares when they list on the NYSE later today then, assuming there are no technical glitches like the Facebook IPO, we are expecting most of the larger financial spread betting companies to be offering a Twitter market by the end of the day. We can already see that IG have set up daily and futures Twitter markets, although it doesn't look like you can add any trading orders to these markets yet. Note that Twitter spread betting and CFD markets may not be immediately available at 2.30pm. It may take a little bit of time for any auctions to go through, prices feeds to be checked etc. It could be 3pm before you can trade. With Twitter listing on the New York Stock Exchange today the official Twitter account for investors gave an update last night on the IPO. "We've priced our initial public offering of 70,000,000 shares of our common stock at a price to the public of $26 per share. "In addition we've guaranteed the underwriters a 30-day option to purchase up to 10,500,000 additional shares of common stock. "Our shares are expected to begin trading on the NYSE on November 7 under the symbol TWTR." The micro-blogging site had originally set a range of $17-$20. Given the above statement, it looks like there's little value left in these markets. Spread bettors and CFD traders may be better off waiting for the Twitter markets proper to open. Besides, financial spread betting markets based on the actual share price normally have much tighter spreads than the IPO grey markets. IG are currently pricing the IPO grey market at $20.55bn - $22.55bn and ETX Capital are pricing it at $20bn - $21bn. If you like your arbitrage, don't hold your breath on this market. Whilst the market isn't that liquid, the spreads are wide. We haven't seen an arb'ing opportunity yet. According to Alastair McCaig of IG, "Twitter is unlikely to be offering dividends any time soon. However, as Twitter is a social network, that will certainly help when it comes to generating its own publicity". When Will Twitter Float / IPO? According to Alastair McCaig of IG, "Using current fillings as a guideline it is likely that we will see Twitter float around the middle of November". 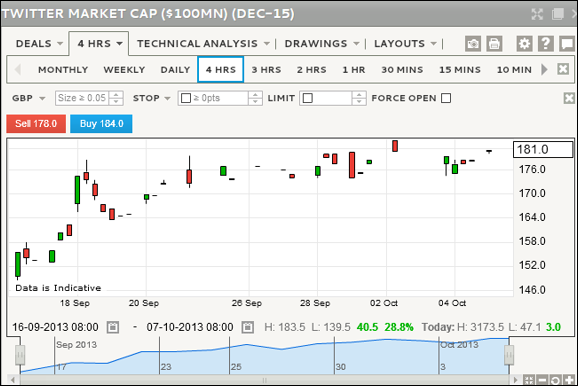 After hitting a high of $19.25bn two days ago, the IG grey market on the level of the Twitter IPO, has settled a little. IG are currently quoting 178.5 to 188.5 ($17.85bn to $18.85bn). ETX are also running a grey market but their quote is riding slightly higher at 1800 to 1900 ($18bn to $19bn). Note that IG and ETX are pricing the markets in slightly different ways, hence we've given the price in billions to make it easier to compare. Since we last looked at the IPO price estimates, the buy price has gone up to a cheeky $18.5bn. Part of this increase could be down to the fact that the company is only looking to raise about $1bn when it lists. To read the S-1 Twitter filing with the US regulator see SEC.gov Twitter S-1. The S-1 gives some interesting details on Twitter in a surprisingly digestible form. The timing of the IPO is still to be confirmed. 26-Sep-13 [2:25pm] With the London Stock Exchange seeing an increase in company IPOs, IG takes a quick look at the latest movements in their Royal Mail and Twitter grey markets. Looking at the moves in the Facebook share price, investors thinking of trading Twitter could be in for a bit of a rollercoaster. Facebook shares listed at $38 per share on the NASDAQ in May 2013. Whilst the NASDAQ stock exchange experienced some well publicised technical problems during the IPO, Facebook also had to overcome a range of other issues when it listed. Having said that, whilst the stock hit a low of $17.58 in September 2013, it hit an all-time earlier this week at $49.26. That values the social network at $120bn. For more details on how Facebook managed to turn around their numbers (and investor sentiment) see our report on How Facebook Shares Turned Around. If you are looking at the difficult prospect of pricing up a company that hasn't been listed on a stock exchange you need to consider the fundamentals of the company. This should include SWOT analysis to help weigh up the pros and cons. What happens if twitter becomes passé and it's no longer a service that the celebrity Twitterers want to be seen using? On the plus side, a cynic might say it's a beautiful symbiotic relationship between celebrity and a cheap marketing/PR platform. Whilst the cost-based and tech-based barriers to entry are relatively low, the key barrier, for a company looking to create a similar service, is needing to generate a very large group of celebrities who frequently use its service. Why would an existing celebrity with an excellent marketing platform leave twitter? Justin Bieber has 44.9m followers, whilst 40.1m users follow Lady Gaga and Rihanna has 31.8m followers. Yes, the 'celebs' might also use another service, but whilst they have access to one of the best free marketing/PR machines they are unlikely to leave twitter in their droves. The above is just my personal opinion and, whether you are planning on buying or shorting the IPO/shares, this is intended to highlight just some of the risks of trading the firm. As always, this is not investment advice. And no, I do not follow Bieber, it would be like following my little brother. According to David Jones, Chief Market Strategist at IG, the Twitter market is looking 'optimistic'. The grey market initially valued Twitter at around $10bn, quickly rose to $15bn and the valuation is now at $17.1bn - $17.6bn. As you can see from the Twitter IPO chart below, the market has (fairly) steadily risen over the last few days and added a couple of billion dollars to the estimated value of the tech firm. 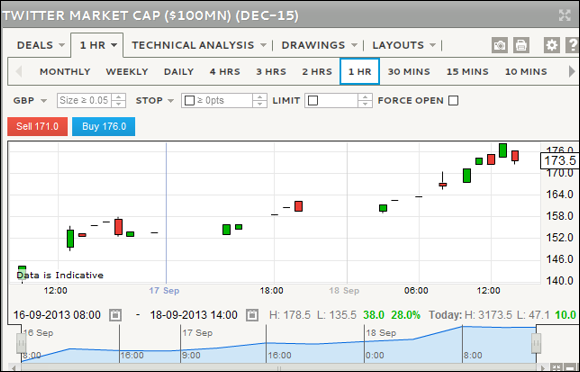 16-Sep-13 [12:39pm] So the IG 'Twitter market capitalisation' grey market is currently at 142 - 147 (where a point is $100m). So despite my scepticism below, that's a reasonably tight spread for a tricky market to offer. According to Ishaq Siddiqi, Market Strategist at ETX Capital, "Private investors are valuing the social networking service at about $10bn. Speculation however, suggests it could be north of that figure, up to $14bn. "Given the hype and drama surrounding Facebook last year, it is possible that Twitter will adopt a more low-key approach, prudently delivering information to the market before the roadshow begins." ETX's current spread for the Twitter IPO is $10.5bn - $11.5bn. According to some of the more informed looking tweets using #TwitterIPO, there is a rather broad "valuation of $14-20bn" and "The last private equity valuation was $10.5bn"
According to the BBC story on the Twitter IPO, "Investors value Twitter, at more than $10bn (£6.3bn). "Twitter has given no further details as to the timing or [share] price of the offering." And according to advertising consultancy eMarketer "[Twitter] is on track to post revenues of $583m in 2013". So Twitter have finally announced their intention to list on the US stock market. An official tweet on 12 Sep 2013 said "We've confidentially submitted an S-1 to the SEC for a planned IPO. This Tweet does not constitute an offer of any securities for sale." Note that the term 'confidential' refers to the fact that the numbers they have submitted to the SEC are confidential, it doesn't refer to the news of the IPO being confidential. 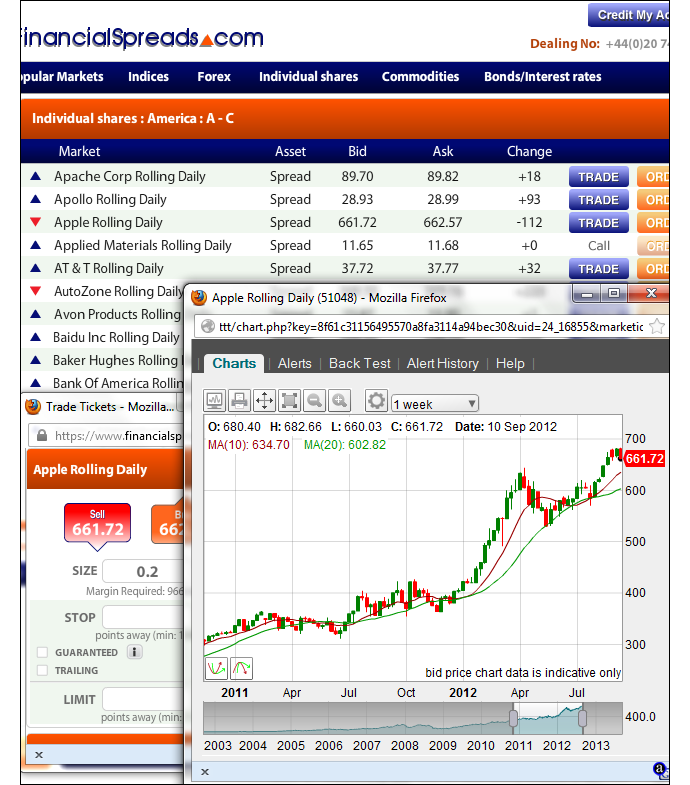 AIG spread betting and share trading guide with daily updates and a real-time AIG stock chart & live prices. We review the US firm's share price, how to... » read guide. Twitter spread betting guide with live charts & prices, Twitter trading analysis, how to spread bet on the social network. Plus CFDs, where to trade... » read from top.